Action from last season's Burghley Park sixes competition. Short-form specialists Oundle Town are new entrants into the popular Burghley Park sixes competition this year. Oundle will take on Stamford Town in a first round tie on the opening night of the competition on Monday, July 4. Full draw: Stamford Town v Oundle, Laxton Park v Nassington, Empingham v Ketton, Burghley Park v Market Overton, Uffington v Ufford Park, Barnack v Uppingham Town, Newborough v Castor, Baston v Oakham. The semi-finals and final will take olace on July 8. 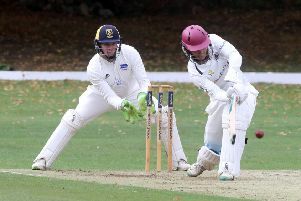 As usual the sixes are an integral part of Burghley cricket week which this year runs from July 4 to July 8. Ahead of the nightly sixes competition Burghley Park will take on Ex Tempore XI, Authors XI, Gentlemen of Lincolnshire, Gentlemen of West Norfolk and the Gentleman of Leicestershire in all-day games starting at 10.30am. The cricket continues to be the main focus, but now also taking pride of place at the event is the Beer Festival in the well-stocked Cabel UK beer tent, supplied by Events & amp; Tents, with plenty of real ales on offer throughout the week. The club has listened to feedback from last year and are pleased to announce there will be a second bar, the Oakham Ales bar, in an attempt to reduce the queues. The food has also been upgraded as we have invited Groovy Foods to provide the evening catering for the event. To finish off the week, once the 2016 sixes champions have been crowned, local band the Hoo Haas will perform and close the event.